Philadelphia Eagles head coach Doug Pederson celebrates after defeating the Minnesota Vikings in the NFC Championship Game. On Wednesday, Philadelphia Eagles safety Malcolm Jenkins, the locker-room leader who speaks to his teammates following each game, admitted that this was likely the easiest season he's ever had in terms of having to lead other players. Of course, winning helps that, but with a ton of new pieces on both sides of the ball, Jenkins also pointed out that other players have stepped up into leadership roles when needed. Most importantly, however, was the close-knit, unselfish nature of the players in the locker room, something that we've heard several times from several different players throughout the season. "I haven't been a part of a closer group," Jenkins said. "This is a special group, to be honest. Guys have taken less money to come here. Guys who've gotten traded here got out of negative situations and everybody plays for each other. Nobody cares who makes the play. We just come to win and have fun doing it. We're looking to keep that formula the same." A lot of that comes from within the players themselves. Some, however, comes from leadership, not just from inside the locker room, but from the coaches as well, especially when you have to overcome the kind of adversity the Eagles have faced this season. In just his second season as the head coach of a team where his players are all old enough to drive – his previous four years as a head coach came at Calvary Baptist Academy in Shreveport, La. – Doug Pederson has his team one win away from delivering Philadelphia its first Super Bowl title. 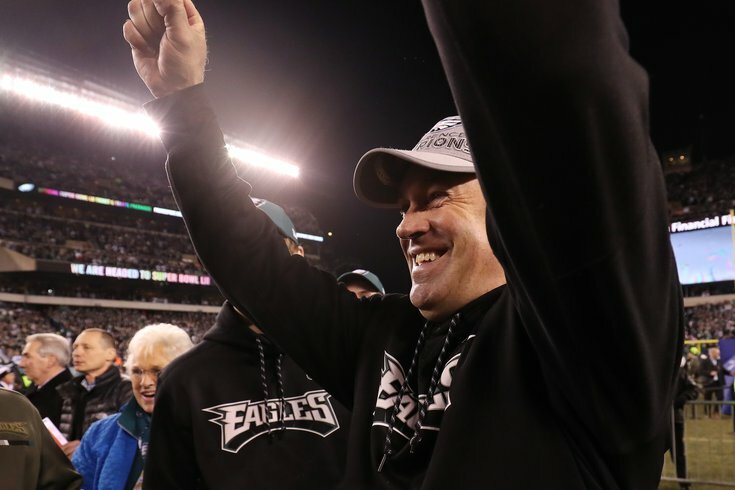 The rest of the world may just be learning about how special this Eagles team has been this year, but Pederson has been telling us as much since well before the season started. So when did he first realize the Birds had a chance to do big things in 2017 (and beyond)? "When I made that statement in training camp," Pederson said Wednesday. What statement? You know, the time Pederson told reporters that the Eagles "probably have more talent" than the Super Bowl champion Packers team he was a part of in 1996-97, a team that made it back to the Super Bowl the following year. "I look back at my time in Green Bay as a player when we were making those playoff runs and those Super Bowl runs there, and do we have as much talent on this team than we did then? We probably have more talent, right?" Pederson said. At the time, that comment received a lot of attention and was laughed off by most. The Eagles were coming off a 7-9 season that had seen them play much better in the first half than the second. They had a bunch of new pieces, who, while talented, still needed to learn the system and fit into the locker-room culture that Pederson began building in his first year. They had a second-year quarterback to go along with a second-year coach, and many were questioning if the latter was the right man for the job. Now? It's making Pederson out to be some sort of psychic (note: just last week he vehemently denied owning a crystal ball). The second-year coach admitted on Thursday that it was more of a "gut feeling" then it was an outright prediction. And while he had a feeling this team could be special, even he didn't know at the time just how special they could be. According to Doug, that didn't come until later in the season. "You really don't know," he said. "You sort of have a gut feeling when you come through OTAs and you get into training camp. You kind of have that like, ‘Oh, man, this could be a special team, this could be a special year.’ But listen, there's guys – I say that, then I go, ‘Okay, well then a lot of things have to happen for you like you've got to stay away from the injury bug.’ Well, we didn't. We've lost some talented guys, some starters, some role guys, specific guys. "But for me, it was probably through some of that adversity early in the year, middle of the season that we kind of kept things together and we were figuring out how to win a game or two or three, and we kind of got on a little bit of a roll. At about that time you kind of knew that, all right, this is a pretty special team, and the sky's the limit with these guys."